I’ve made no secret of the fact that I absolutely loved Lapland and Northern Norway when I visited last year. My 28-day circuit around the region was full of crazy experiences and memorable places to stay, and I’ve never had a holiday quite like it. One thing I noticed when planning this trip, though, was that there weren’t many cohesive sources of information for people travelling through multiple countries in the region. If I wanted information on Finnish Lapland, there were a number of websites dedicated to it…but rarely, if ever, would they mention the presence of a Swedish or Norwegian Lapland, which is made sense because they were focused on a specific region in a specific country. 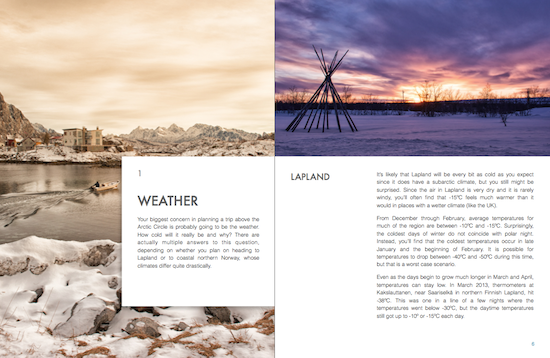 My new eBook that will help you plan your trip to the Arctic North. All the planning that went into my trip, plus the 28 days that I spent there, meant that I got the answers to many of these questions. I also tried out every activity I could possibly find — from jumping out of a snow-filled RIB boat to snorkel in the 4ºC waters of a fjord to hovercrafting through the Luleå archipelago, I did as much as time and my budget would allow. 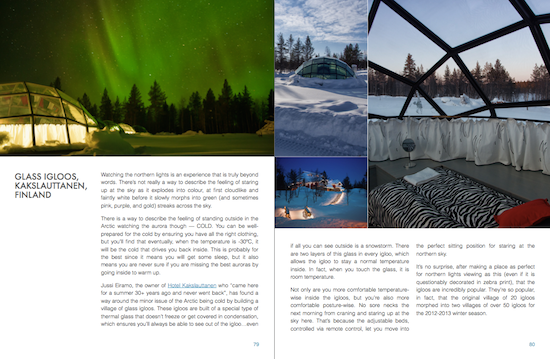 The section of the ‘Activities’ chapter about the glass igloos at Hotel Kakslauttanen. One of the big things that struck me about my time in Lapland was how easy it was to travel around, even for ‘winter beginners’ like me. As someone that has always lived in sub-tropical climates who is the one that puts on a jacket if the temperature dips below 15º, I initially thought I would absolutely freeze and that I would have difficulties trying to navigate the region as a solo traveller. How wrong I was. The buses there are more on time than in Brisbane, which has balmy, sub-tropical weather year-round. The same applies to all modes of public transport. The whole region seems to come to life in winter, when tourists flock there to experience the northern lights, winter activities, and cold that doesn’t feel quite as cold as it should because it’s so dry. As you would expect, there’s an entire chapter about what to expect from the weather. Plus, I got so used to the temperatures that by the time I got to Rovaniemi to catch my flight home, I was wearing a T-shirt in 3º temperatures. I had to take my jacket off because I was sweating! As you know, I’ve shared many of my adventures and learnings here on this blog — so much so that Lapland has now become one of my major focus regions (along with Australia and New Zealand). 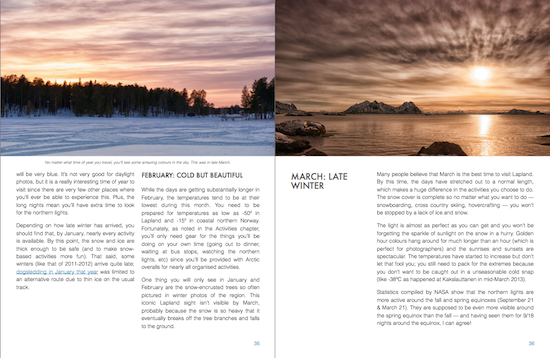 While I’ve had a great response to these, I wanted to put all of the information into a more cohesive format…and thus, A Guide to Lapland and Northern Norway in Winter was born. 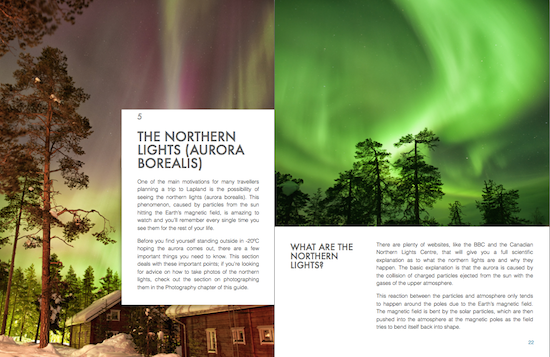 A guidebook to Lapland wouldn’t be complete without mention of the northern lights. I’ve got a chapter and a half about them! This guide isn’t a traditional guidebook in that it lists everything you could possibly do in the region. It’s a general primer to answer all the logistical questions you have as well as inspiring you with all of the options you’ll have once you arrive. It’s currently available as a PDF, on your iPad or iPhone through the iBookstore, and as a Kindle eBook and printed guide. Plus, it’s fully illustrated with all of my own photos from the region — everything from the northern lights dancing over a glass igloo to scenes from a ship cruising along the fjords of the northern Norwegian coast. I’ve had a few people tell me they’ve been inspired to visit the region — when they had no previous plans to do so — just by looking at the photos! Not sure when you should head to Lapland? I’ve got some tips about that too. So whether a trip to the Arctic North has a top spot on your bucket list or you have a trip coming up in January, it’s worth checking out A Guide to Lapland and Northern Norway in Winter. I hope it comes in handy; if it saves at least one person a planning headache, I’ve done my job. Interested in buying it? Head over to my store or find it on Amazon. Like to learn more? Check out some sample chapters in PDF form. 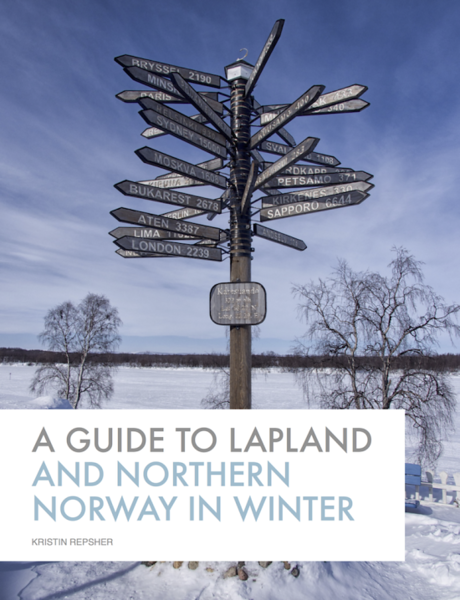 Do you have questions about the guide, or just about travelling Lapland in winter in general? Ask me in the comments below! Congrats on the book! I love seeing your pictures from this area, and even though I hate cold weather, I’d love to go someday. I also list Widerøe as an airline that can be used in this region. So I definitely wasn’t saying it’s completely impossible — just that it’s difficult, particularly in Swedish and Finnish Lapland. Perhaps I should make it clearer that northern Norway has more connections (especially through Tromsø, but through many of the towns that have airports serviced by Widerøe)?